This is a sponsored post. we have been compensated for our honest opinion, for more information please read our Advertising Disclosure Statement. What is CouponPaste? 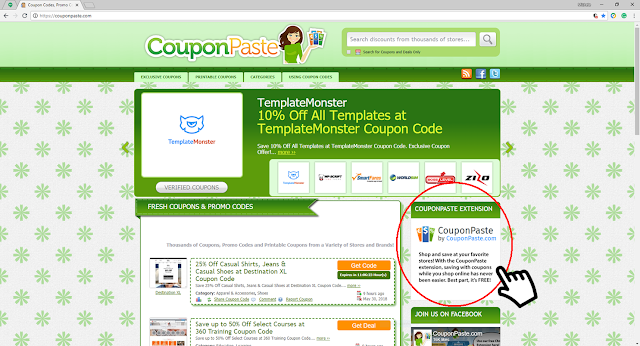 Established in 2012, CouponPaste is a coupon site that offers digital coupons, printable coupons, exclusive coupons and coupon codes. They now offer a free browser extension. 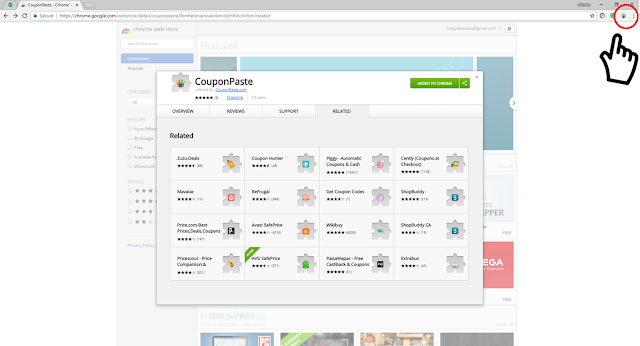 The CouponPaste extension is available for free on Chrome, Firefox, Internet Explorer, and Safari. For the purpose of this review, we will be focusing on the coupon paste browser extension for Chrome. or by typing couponpaste.com/get-the-button/ into your browser address bar and clicking enter. Then Click "Get The Button"
This will take you to the Chrome web store, where you will then click on the "Add to Chrome" button. After you click on the "Add to Chrome" button, a small pop-up will tell you what this extension can do if added. This is a standard pop up when adding an extension to your browser. To confirm, just click "Add extension"
That's it, the extension is ready to use. No sign-up required. You should now see the coupon paste icon in the upper right-hand side of your browser. 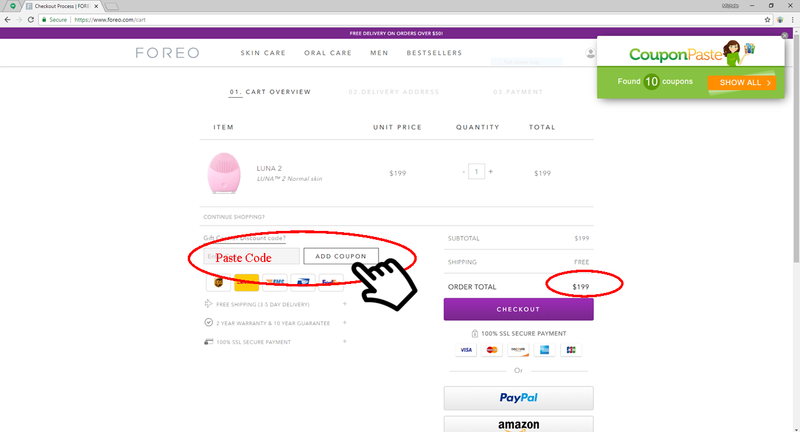 When you click on the icon a drop-down menu appears where you can explore coupons, stores, and categories. Right away we were impressed with how simple and easy the CouponPaste extension is. 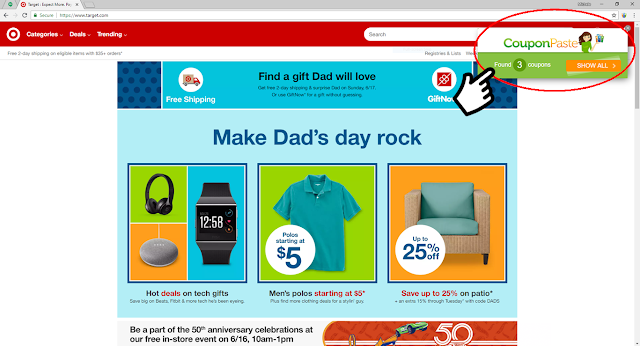 We simply went to some of our favorite stores online and when there were deals and/or coupons available, a box would drop down in the upper right-hand corner of our browser. 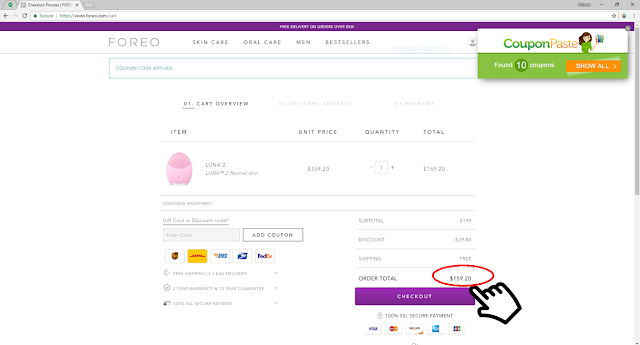 You just click on the "Show All" button to see what coupons and deals are available. 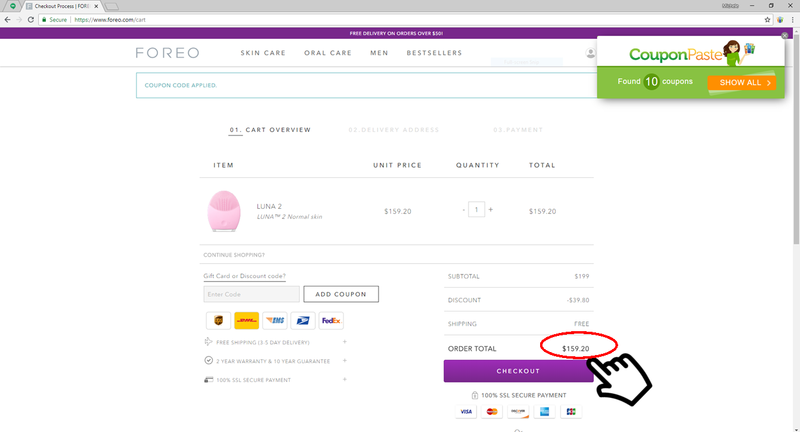 When you click on "Get Deals" or "Get Codes" the coupon will be copied to your clipboard automatically. When you're ready to check out just paste the coupon code in the coupon/promo code box in your shopping cart or at the checkout and then apply code! You should see your savings immediately applied! Shopping at your favorite stores just got easier! 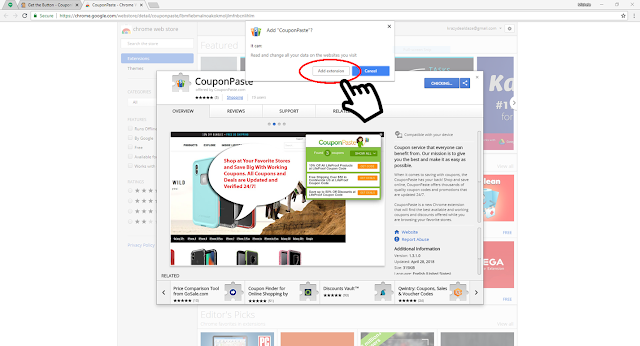 Another feature we really like about the CouponPaste extension is that it also works on popular search engines like Google, Yahoo, and Bing. 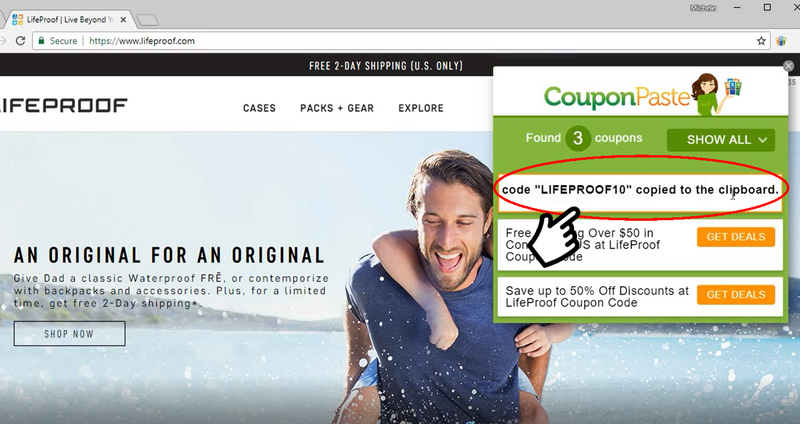 Whenever you're searching for something on one of these popular search engines a CouponPaste button will show up next to the stores who have available deals and/or coupons. What we like about the CouponPaste browser extension, not only is it free but it also requires no membership or sign-up to use. We really like it's simple, user-friendly design, with hundreds of categories, thousands of promotions and coupons codes that update 24/7. 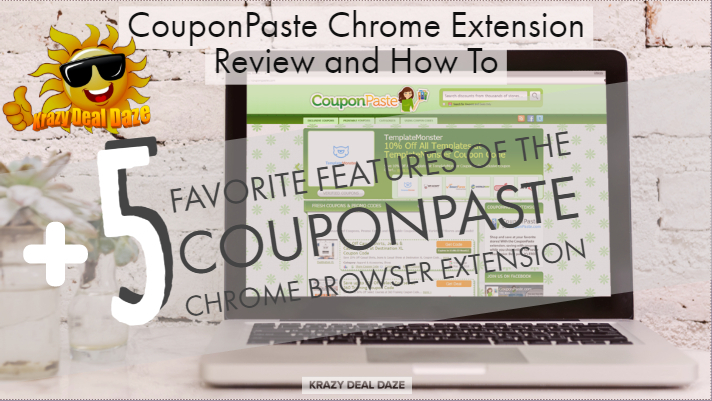 If you're looking to save money the next time you shop online we here at Krazy Deal Daze recommend downloading the FREE CouponPaste Browser Extension. 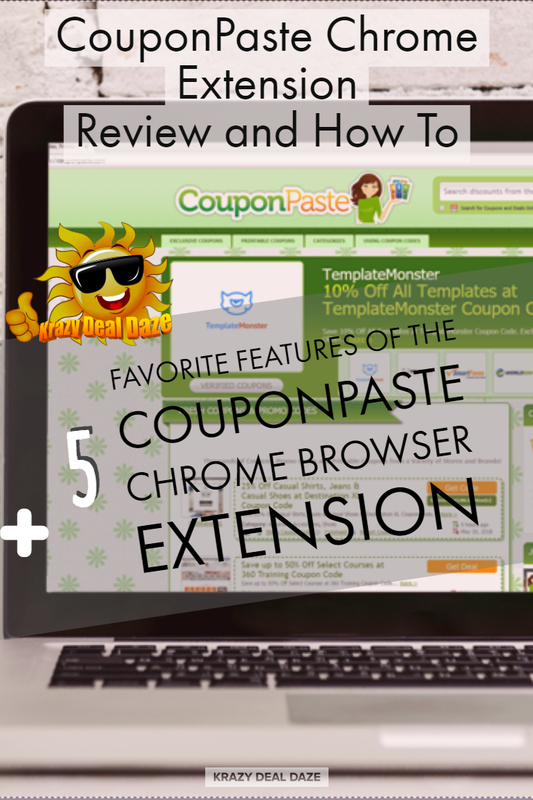 Thank you for stopping by and checking out our CouponPaste Chrome Extension Review and How To! Have you ever heard of CouponPaste.com before? Have you tried their new browser extension? What did you think? Be sure to let us know in the comments below! I'm always a bit hesitant to add shopping extensions on my browser. I hate the fact that I feel as though I'm being followed everywhere online and judged by items I peruse. But this does sound like a pretty good one that could save some money. This is an easier way to make sure you get all those awesome deals! I've never tried installing an extension like this before but it's really making me curious. I havent tried having a coupon post on my site. Thanks on the step by step process. A must have extension for all shoppers. Seems really interesting. Thanks for sharing. I love promotions and giveaways. I will definitely check out CouponPaste. I have seen it before but I just did not give it attention. Glad to know its now available for Chrome. Wow, this sounds a great extension to save amounts. I usually keep on looking out for deals and coupon codes for some discounts. I'll for sure try using couponpaste extension. Sounds simple and user friendly. I love it when they come up with such useful extensions! They are a life saver! I'm always looking for codes to save money! Does this one work for UK sites too? Oh I have read a lot lately about chrome extensions but I am yet to use one! This sounds like a really helpful tool! I am a total coupon junkie. I wish we had more of these types of savings here in the UK. I envy you there in the US because you can shop for discounted stuff with the coupons that companies publish. huhu When I was there, we really enjoyed shopping with coupons.